Trust in UK broadcasting has been dealt a blow after a number of revelations about TV and radio shows that misled audiences or left them out of pocket. Blue Peter was fined £50,000 by media watchdog Ofcom after a child visiting the studio was asked to pose as a phone-in competition winner. The show was also forced to apologise after the results of a poll to name the show's cat were changed by staff. The programme's editor, Richard Marson, has left, but the BBC refused to confirm reports he was sacked. Two votes for award winners on the Asian Network's Film Cafe in February were overruled by a member of the production team - one because of an error in reading results and the other because the genuine winner was unavailable for interview. On the Clare McDonnell Show on BBC 6 Music in September 2006, a production team member created fictitious winners because there were not enough real winning entries for a competition. The offer of tickets from a band resulted in an ad-hoc competition in September 2006 on Tom Robinson's 6 Music show. But no entries were received and a fictional winner was invented, whose name was then broadcast. BBC One controller Peter Fincham quit after the Queen was wrongly portrayed as storming out of a photo session in a trailer for BBC One documentary A Year with the Queen. Scenes were shown in the wrong order, leading the chief creative officer of production company RDF, Stephen Lambert, to also resign. "Minimal" phone profits from BBC One's Saturday Kitchen were donated to charity after it admitted viewers had been asked to phone in for a show they had no chance of appearing on. During a Comic Relief competition in March, a member of the production team posed as the winning caller after a problem with the phone lines. In September, viewers of the children's show TMi were led to believe a member of the audience had won a competition. But it turned out to be a member of the production crew. A member of the production team for Sport Relief posed as a winner on air last July. The BBC found this had been set up in advance as a contingency plan and that warnings about potential difficulties in conducting the competition were ignored. In a section called Raven: The Island in a Scottish segment of Children in Need in 2005, viewers were led to believe a phone-in competition had been won by a viewer. But in fact, the name of a fictitious winner was read out on air after a technical mistake. The BBC 6 Music Liz Kershaw Show used members of the production team and their friends as competition callers from 2005 until a new producer took over in December 2006. The network's head of programmes Ric Blaxill resigned and a producer at the station has been sacked. During White Label, a weekly pop music preview programme on the World Service, on more than one occasion, a fake winner was announced for the CD prize when no winning entries had actually been received. A member of staff had posed as a competition winner during Jo Whiley's Radio 1 show in April 2006. Several staff members were disciplined. The BBC said the DJ, who hosts the mid-morning show, was unaware that the caller was not a member of the public. GMTV was fined a record £2m by media regulator Ofcom after it was found that some callers to its premium rate competitions had no chance of winning. Phone-in operator Opera Telecom was also fined £250,000, and two GMTV executives resigned. ITV will not screen this year's British Comedy Awards after reportedly finding irregularities with phone voting on the 2005 show. A law firm has been called in to investigate. ITV refused to give details and said it would not comment further until the investigation was concluded. A documentary about an Alzheimer's patient, Malcolm and Barbara: Love's Farewell, was wrongly publicised as showing his moment of death. Film-maker Paul Watson blamed ITV for mishandling the programme, while ITV said he was responsible. X Factor overcharged viewers by a total of £200,000 for votes cast via the red button in its most recent series. Around 11,500 text votes for ITV1's Dancing on Ice final were not processed properly because of a "technical problem" at the Vodafone network. 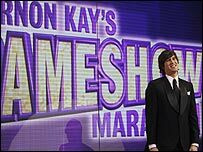 ITV1 apologised after about 10,000 texts for a prize draw competition on Gameshow Marathon were not counted. ITV's phone-in quiz channel ITV Play was scrapped after some of its competitions came under fire for being almost impossible to answer. 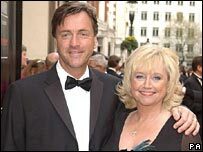 The company behind Richard and Judy competition You Say, We Pay was fined £150,000 after viewers were urged to call a premium number after contestants had already been chosen. A scene in Gordon Ramsay's The F Word was made to look as if the chef had caught several fish at sea. He was filmed returning to the shore with a number of sea bass - but a spearfishing expert had caught them beforehand. Five was fined £300,000 for faking winners on its Brainteaser quiz show. It was found to have broken the Ofcom code five times, including one instance where a crew member posed as a "winning contestant".